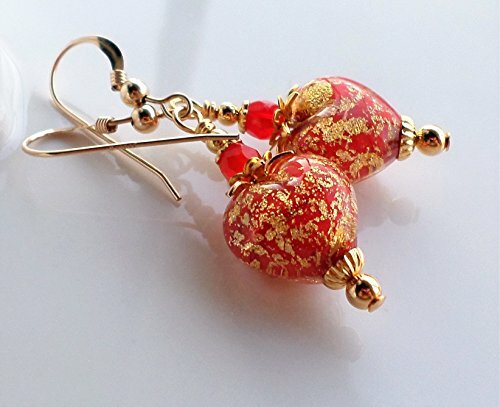 Red Gold Murano Heart Earrings by H&H Jewelry Designs at Nicky's Blog. Hurry! Limited time offer. Offer valid only while supplies last. Such darling well made beads!! The focal beads in these new earrings are genuine Murano Venetian glass beads formed into the shape of cute hearts! Such darling well made beads!! The focal beads in these new earrings are genuine Murano Venetian glass beads formed into the shape of cute hearts! The beads are more petite, measuring just 1/2 inch each. They have a core of Red, a coral Red, and rich layered flakes of real 24KT gold foil, all protected with layers of clear Moretti glass. Above I have added matching Czech Fire Polished glass beads and 14KT gold filled french ear wires. Length: 1 3/4 inches.